“What do you want to be when you grow up?” How many times have you heard a little boy answer, “A firefighter!” Well, 2017 Nyack College alumna Emily Sigmon may not have made that declaration when she was a little girl, but today she’s the only active female member of Nyack Fire Department’s—Jackson Fire Engine #3. Based on her degree major, the Ohio native may have envisioned putting out “fires” (or “stirring them up”) in people’s lives and Emily hasn’t abandoned that pursuit. She’s currently enrolled in the Master of Divinity program at Alliance Theological Seminary. She has also earned provisional licensing as an official Christian and Missionary Alliance (CMA) worker, which positions her for CWM, (Consecrated Woman in Ministry), status with the C&MA. 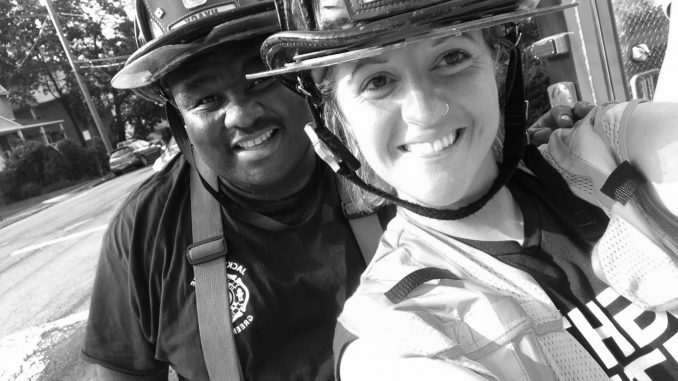 As an “exterior firefighter” with the Nyack Fire Department, Emily explains, “I am only allowed to do things outside of the buildings right now until I complete a training course to prepare me for the elements I will face inside a building.” She started that training, which meets three nights weekly and some weekends until the middle of September 2018. After completing the required 230 hours and passing the exam, she will be certified through New York State to fully respond to both exterior and interiors calls. As she waits for an opportunity to extinguish flames or function as a first responder, Emily won’t be twiddling her thumbs. Her summer “to do list” includes horseback riding on the beach in Florida, traveling to Alaska, skydiving with friends, and continuing her epic summer cooking challenge. She taking full advantage of Nyack’s incredibly diverse community of friends and invited them to teach her how to cook their favorite meals. Follow her on Instagram #summercookingchallenge” to see who’s joined her in the kitchen.